– to best serve you and your business. Do you feel like you’re always behind? Running around, doing one thing after the next without stopping for a moment to breathe or ask yourself if it makes sense, because “this is what the experts say” you have to do? Does it exhaust you, leave you overwhelmed, unsure if you can do it and makes you want to throw in the towel and go sleep for a decade? 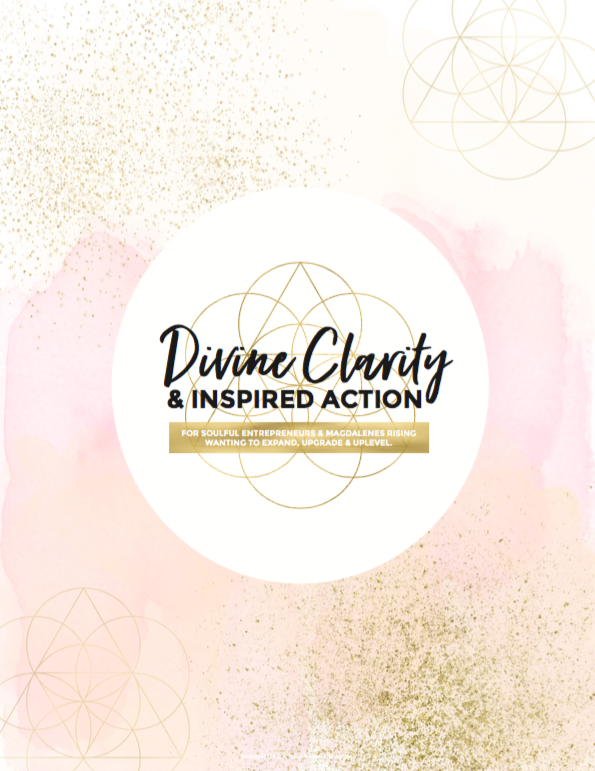 Tired of all of the pushing and shoving, forcing, coercing and convincing that seemingly needs to happen both within you to get anything done, but also to get new clients? This is second of two most common imbalances I have found in my work with soulful entrepreneurs. I call it “The Headless Chicken” and it is the result of you suppressing and ignoring your Divine Feminine Essence of Being, Gnosis, Wisdom and Knowledge, not allowing her to work in close partnership with your Divine Masculine Essence of Doing, Creation, Action and Power embodying the Sacred Marriage. This is when you are not only cut off from your Divine Feminine Essence, but also from your Divine Masculine Essence and have veered far into the territory of their Shadow Aspects. Disconnected from your Source you run around like a headless chicken without sense of direction and fulfilment. You not only rely fully on external “forces” to tell you what to do, how to do it and when to do it, but you constantly, actively seek it out – following blindly their lead even when there’s something in you that revolts. Something in you that says “this is not right”. Let me be clear – this is not right. It like getting gravel in your shoe. At first its a little bit uncomfortable, but you can live with it so you ignore it. Pushing the gravel around, empty out the shoe and be fine for a little while longer. However, as you continue to try and ignore it, at some point the gravel begins to bug you. Irritating you and slight discomfort becomes a constant part of your life. You’re angry – with yourself and the world. You feel sorry for yourself often. You run around doing one thing after the other without seeing any result. You feel like you’re been punished by the Universe for no apparent reason. You have bouts of jealousy because everyone else seem to “get it” while it eludes you. You lash out, hurting, at others but the vitriol that lives within your mind has no comparison. You hate your clients for bugging you. You feel like the whole world is against you. You project and blame others for your misery. You feel locked and frozen. You feel unloved and unwanted. You blindly produce one offering after the next. You may be financially succesful but feel completely drained internally. You have everything you ever wanted and still you cry yourself to sleep at night. You’re worried that the world will find out what’s going on behind the scenes. – and the thought of another way makes your throat and heart clench out of fear that you will miss out, be too late, not have enough or that someone will finally figure out how big of a fraud you really are. Whenever we deny, suppress or ignore the expression of our Divine Essences, be it Feminine or Masculine, for longer periods of time, we veer into their Shadow Aspects. This then expresses as a form of hyper-masculine or feminine or what I call the Shadow Aspects (it’s important to understand that one is not better or worse than the other and there’s nothing wrong with them – they are simply signposts and gateways). Words, feelings and emotions like jealousy, misery, projection and blame are hyper-feminine/shadow feminine. They arise when your intuitive wisdom, knowledge and gnosis is not expressed. Rather than an empowering, uplifting and creative action and effort (Divine Masculine) based in inner wisdom and knowledge (Divine Feminine) aka the The Sacred Marriage or Divine Union we resort to the Shadow Aspects whenever we, for some reason, feel we cannot express and embody what is truly calling us. Expressing and embodying our Souls Divine Purpose. Radiant One, if you’ve found yourself in what you have read so far… first of all I want to truly acknowledge you for your continued reading. I am speaking to the Highest in you. The Divine Self that you are, always have been and always will be. While you may have felt completely disconnected from your Source, your Source never left you, never have and never will. Your Source is what brought you to this article and I welcome you with open arms. Know that within my sacred space there is nothing but loving, kind and caring seeing. Which, in itself can be the toughest pill to swallow when you do not feel worthy or deserving, but hear this my Love – you are. It is beyond doubt, because you are. You were born as a ray of light who together with the billions and millions of other rays form sunshine. Understand that nothing you have gone through, and will be going through is ever a test. My love for you is without boundaries. You are me, I am you. We are. Love. Love does not test but strengthens. Love does not cover but illuminates. Love does not lie but speaks truthfully. You are love my Radiant One. Your current predicament is nothing but a result of your disconnection from Source. Your disconnect between mind and heart, body and soul, spirit and matter. – and so, it is time to re-connect, re-claim and reveal who you truly are. Time for you to embody your wholehearted Magdalene nature, connecting mind and heart, body and soul, spirit and matter. While walking in darkness ain’t fun, this is where you discover your true strength, your true power, your divinity. It is in your darkest hour that you will see that you are the light. The revelation that brought you here is what will show you the through. Through, because there is no way out. It is with by the Mastery through love that you will reclaim what you never lost. – and so I invite you to see your anger and frustration as gateways calling your attention. You alone hold the key to how and what the embodiment of your divine purpose aka your business looks like to you and working with your Shadow Aspects are highly illuminating for the mere fact that they not only give you a clear sign that something is off and not right in your world, but also in that, when you find the root cause you also have your solution. If you’re jealous of others, what is the underlying, unfulfilled desire fuelling that? If you are constantly convincing clients to sign or buy from you what is the underlying fear? If you are tired of spinning in circles, blindly following “expert advice” why do you? If you project and blame others for your misery, what will happen if you take responsibility? It is time, and you are ready. You were born to this. The key, as always is Love. Use the 5 Ancient Gateways for healing and transformation to support you. Acknowledge yourself for having come to the realisation you are now having. Be compassionate – wrap yourself in loving arms as your Divine Mother is. Forgive – let go of your preconceived notions about yourself and how things were supposed to be. Let gratitude fill you, you are blessed. Surrender and let your Divine Self guide you. Your Divine Feminine Essence is the starting point from which everything grows. It is time for you to allow her a sacred space where she can unfold her wisdom, retrieve gnosis, inspire action. She is one of strength, stillness and resilient peace. Begin a practice of meditation, silence and quiet time – do not be discouraged if at first it is hard, that is only to be expected. Wrap yourself in the ever loving arms of a mother who swaddles her baby. You are being born anew. Begin a practice of tuning in before stepping out. Meaning, before you begin a task, take a moment to simply breathe deeply and connect. Before you get on a call send a silent blessing to the person you are joining. When you stand in line, waiting for your coffee, bless those around you and send them your highest regard. Train and strengthen your intuitive muscle just as you would had in been a physical one. Other ways to engage her can be through the use of smell or sound. If you’ve been used to running around, doing all the time; lavender is an amazing calming oil. If you find it hard to speak up, practice using your voice. Activate your throat chakra by putting on a song you love and sing from the top of you lungs. As it gains in strength, use it to speak for what is right and true. The Divine Feminine Essence loves connection, presence and being, so seek out sisterhood with women. I’d love for you to share your revelations in the comments below – what’s one key discovery that you’ve made about yourself reading this article? – and, if you’d like to be supported as you find a more loving, kind and caring way of executing your business check out the ways we can work together. The other of the two most common imbalances I call “The Lazy Duck” – you can read all about it here.